algae from inside of your pool. Always clean the pool filter. This ensures that all of the old algae is out and/or removed from the bottom of your pool. If the algae is trapped within the filter, this can possibly allow new algae to grow. A dirty pool is an unhealthy pool. Vacuum up the old algae from the bottom of your swimming pool. Wait until all of the new algae is completely gone before vacuuming the residue of the old algae altogether. You will be able to tell that the difference between old and new algae by the colors. 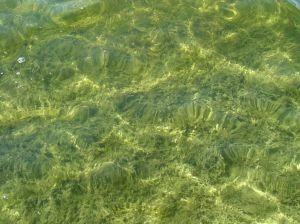 Old algae tends to have a white or grayish color to it while new algae has a green hue. Make sure the pH levels for your pool are correct. The chlorine works better when the pH levels are efficient because it helps kill off algae or stops it from forming. By testing your pool’s chemical level, it helps balance your pool. Putting algaecide inside of your pool on a weekly basis also prevents algae from reappearing. If you have any other questions about removing algae from your swimming pool or are interested in purchasing a swimming pool, visit Viscount Pool West at any of our locations.